Want a means of identifying your bag? Want proof that the bag you have is yours? 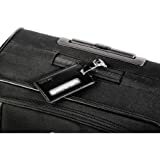 Want a means for your luggage to be clearly identifiable in the instance it has gone astray? Luggage tags have traditionally been used by bus, train and airline companies to route luggage to a final destination. However, it is common knowledge, particularly in airports, that some bags go astray and that your luggage sits amongst hundreds of other similar bags of luggage at the baggage carousel. This can make it very difficult to identify which is yours and increases the potential for one customer to take your bag in error when tired after a long flight. One means of making your bag stand out would be to paint it florescent green or yellow but why go to these extremes when you can simply, quickly and easily add this Hama Premium Luggage Tag to your bag. 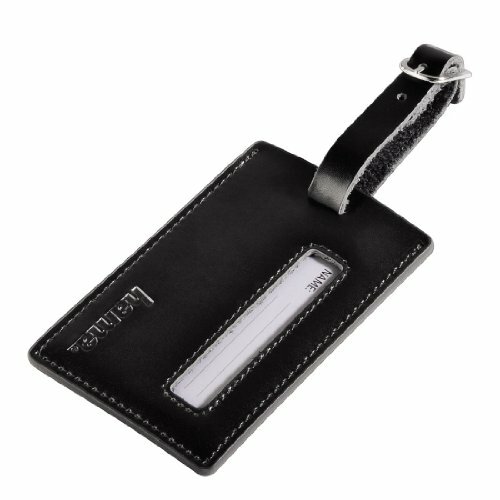 This Premium Hama Luggage Tag, made from high quality classic black Koskin material, is an easy to write on luggage tag which can be securely attached to any loop or hanger via the strong binder loops to make your luggage more readily identifiable, without drawing too much attention to it. This tag give you plenty of space to fill in your name, address and telephone number and the great thing about this tag is that only the name is visible. The address and telephone field is inconspicuous, so you can keep all your personal details aside from your name under the cover which can be pulled out when necessary. Furthermore, should you be unlucky enough that your bag goes astray, these tags will make it quick and easy for the locater of your lost bag to contact you quickly and easily without the hassle of having to engage in the acrobats of locating the owner.